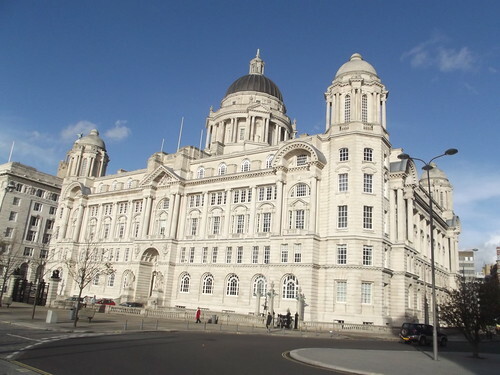 The Three Graces – Liverpool Waterfront. All Grade II* listed buildings (apart from the nearby modern buildings). Office building. 1907. Arnold Thornely. Portland tone. floor window round-headed, 1st floors, and corner bays. window round-headed, 1st floor windows in eared architraves. colonnettes, centre and end bays have Diocletian windows. glazed drums and coupled Ionic columns supporting domes.